The only time when going slower will achieve something great in sports is related to the rate of protein digestion. It is important that protein absorption is fast right before or after exercise, but a delayed release is advantageous all through the day and during the night. The prime ingredient for this feature is casein. 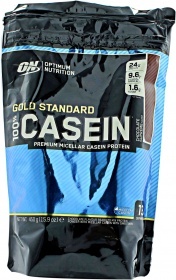 Optimum Nutrition 100% Casein contains two types of casein; micellar casein and calcium caseinate. Micellar casein is highly anabolic and is great to build more muscle. Calcium caseinate, breaks down a lot slower and is great to provide food to muscles for longer periods. 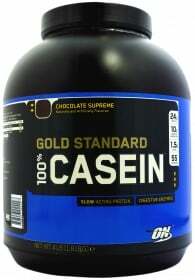 100% Casein Gold Standard has a pleasant, thick texture that will make you feel full straight away. It works best right before bed, helping you to put on more muscle during the most anabolic period of the day, that is when you sleep! It will allow you to go to bed satisfied and nurture your body during the whole night, making you feel well recovered and ready for another intensive training in the next day. Bodybuilders and athletes that look to build muscle or avoid muscle breakdown and reduce recovery times will benefit from this protein in particular since it works best when your body goes to rest! Have a question about 100% Casein Gold Standard? What is it, what does it do, how and when to use or something else? Ask us. “100% Casein 32g” is currently out of stock. Enter your details below and we will let you know when it's back in stock. “100% Casein 24x32g” is currently out of stock. Enter your details below and we will let you know when it's back in stock. For Gold Standard 100% Casein Using a shaker cup is the easiest and most convenient way to mix up a consistently great casein shake every time. Just add one heaping scoop of Gold Standard 100% Casein(TM) to a shaker cup filled with 300-360 ml (10-12 oz) of your preferred beverage. Cover and shake for 25-30 seconds. TIP: Adjust the intensity of your Gold Standard 100% Casein(TM) by varying the amount of liquid that you use to prepare it. For a bolder flavor with slightly more body and sweetness, mix one heaping scoop with 240-300 ml (8-10 oz) of water, milk, or your favorite beverage. For a milder tasting, less sweet shake, use 360-420 ml (12-14 oz) of liquid per scoop. BLENDER: Add one heaping scoop of Gold Standard 100% Casein(TM) to a blender filled with 300-360 ml (10-12 oz) of water, milk, or your favorite beverage. Blend for 20-30 seconds. Then add 3-4 ice cubes and blend for an additional 30 seconds. SHAKE UP YOUR SHAKE: By adding a few high-energy ingredients to your shake you can blend up a delicious meal: try adding fresh or frozen fruits (strawberries, bananas, peaches, etc. ), peanut butter, flaxseed oil, yogurt, coconut, slivered almonds, or other ingredients. STACK YOUR SHAKE: By adding supplements like Micronized Creatine, Glutamine, Taurine, and/or INSTANTIZED BCAA powders, you can make your shake an even more powerful recovery product. SPOON STIRRED: If you forgot your shaker cup or don't have time to get out the blender, you can just add one heaping scoop of Gold Standard 100% Casein(TM) to a glass filled with 300-360 ml (10-12 oz) of cold water, milk, or your favorite beverage. Then mix it up with a spoon for about 30 seconds or until powder is dissolved. SUGGESTED USE: Consume approximately 1 gram of protein per pound of body weight per day through a combination of high protein foods and supplements. For best results, consume your daily protein allotment over several small meals spread evenly throughout the day. TIP: Try using "slower" Gold Standard 100% Casein(TM) with "faster" proteins like Gold Standard 100% Whey(TM) or Pro Complex® at different times for maximum effectiveness. Take Gold Standard 100% Casein(TM) immediately before bed and in between meals when delayed protein delivery is desired. Drink Gold Standard 100% Whey(TM) or Pro Complex® proteins before and immediately after workouts for a rapid "shot" of amino acids. DO NOT USE AS A SOLE SOURCE OF NUTRITION FOR WEIGHT LOSS OR MAINTENANCE. KEEP OUT OF REACH OF CHILDREN.